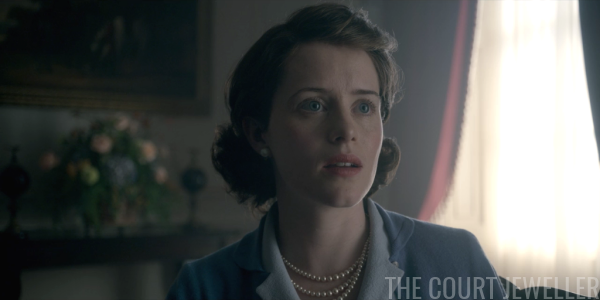 The coronation may be over on The Crown, but we've still got plenty of jewels and drama to dissect. Here's our bejeweled recap of episode six, "Gelignite" -- and catch up on our previous recaps here if you've missed any! 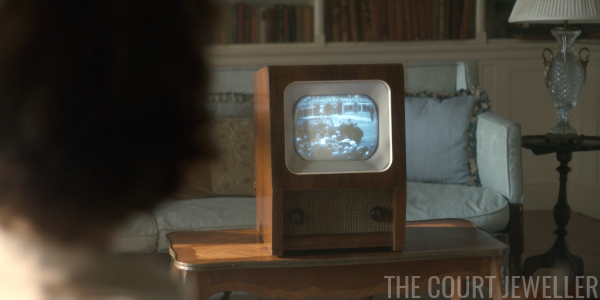 At Clarence House, Princess Margaret watches footage of her sister on television. Elizabeth's post-coronation popularity is soaring. Some of the footage shown is from the original British Pathe newsreels from the event. 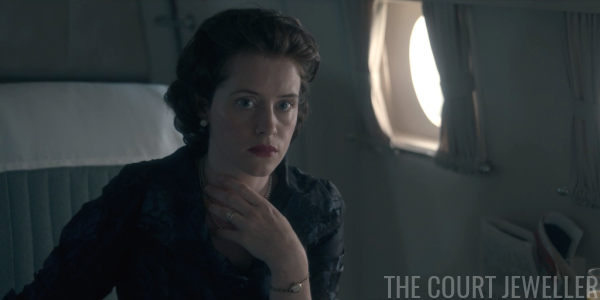 In real life, Princess Margaret attended the Coronation Derby with her sister, and she appears in this footage with numerous other members of the royal family (and foreign royals, too). You can see video of it here and here. 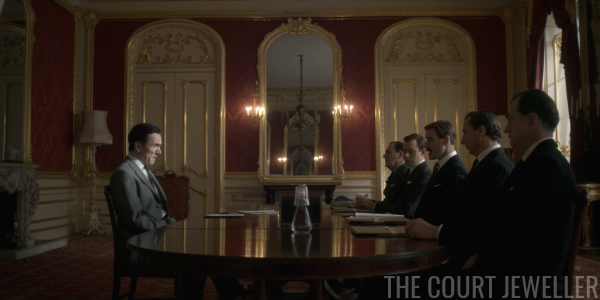 In the last episode, we saw lots of mirrors as sovereigns regarded themselves. In this episode, we get a mirror of a different kind, as the royals watch themselves reflected in different kinds of press coverage. Fictional Margaret is likely watching a recap of the event she attended earlier in the day. She and Peter Townsend banter about her sister's fame; Margaret, who is wearing a ring on her right hand, notes that she's the luckiest woman, even if her sister is more famous. And they're going on a trip to Rhodesia together soon! Everything's great. 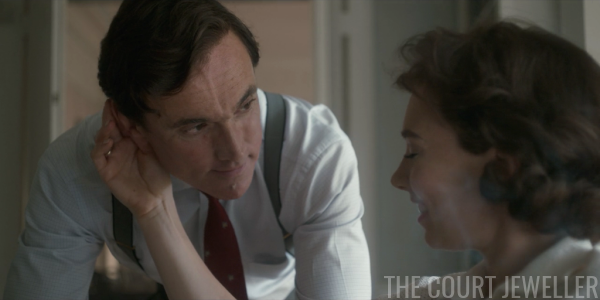 Margaret and Peter's secret love is about to be not-so-secret. 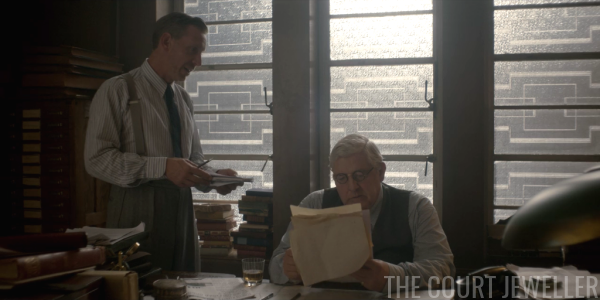 A reporter from the News Chronicle noticed her picking a piece of lint off of Townsend's uniform at the coronation, and he's planning to write a story about it. 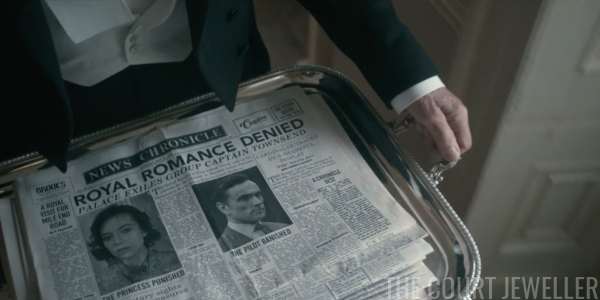 In real life, the newspaper that broke the story of the Townsend affair was a Sunday paper, People, following stories in the American press. Margaret has decided that it's time to have a serious chat with her sister about Peter. 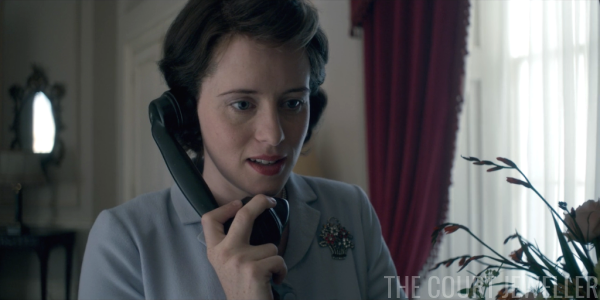 She calls her up -- which, as we see, involves a dizzying number of switches and operators and connections -- and invites her (and Philip) to dinner. Elizabeth wears the Flower Basket Brooch (often used in this production as a symbol of family, and in scenes connected with the late king) as she accepts the invitation. Yep, that's Philip checking out a waitress's derriere. 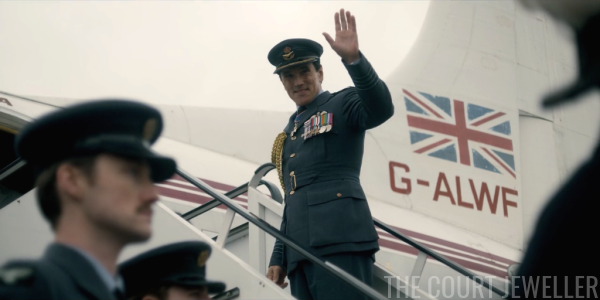 It's often said that Philip has had various dalliances during his long marriage to the Queen, and The Crown is playing with that idea a bit in an episode about marital fidelity and morality. 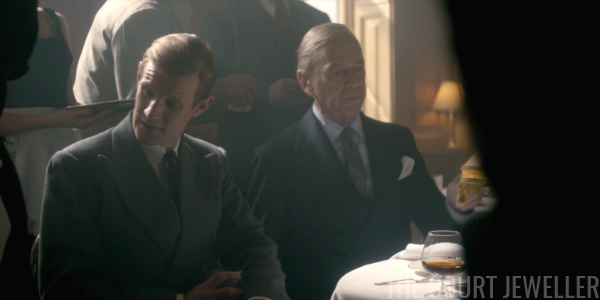 The man sitting beside Philip in this frame is Baron, the court photographer who took Elizabeth and Philip's wedding pictures. The special guest at this meeting of the lunch club is Tony Longdon, who has just returned from Cairo. 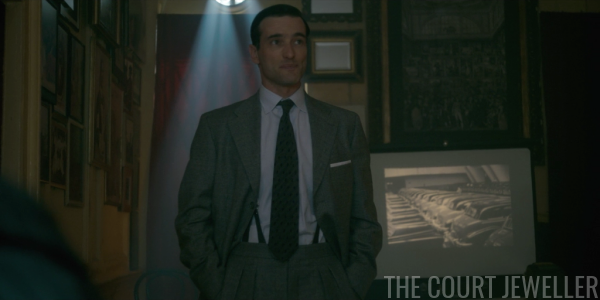 (Longdon is played by Ed Stoppard, who starred alongside Claire Foy in the recent series of Upstairs, Downstairs.) Longdon has sobering news from Cairo, where King Farouk was ousted in a military coup the previous year. Philip, who thinks a lot about the precarious nature of monarchies, is very interested. 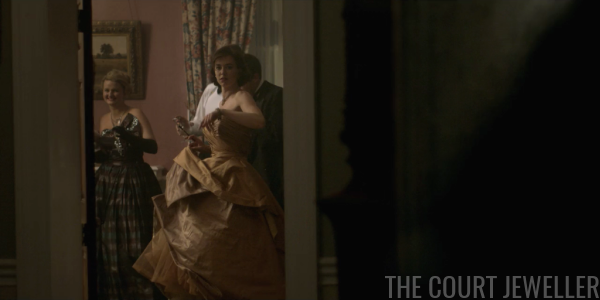 That night, Elizabeth and Philip get ready to go to dinner at Clarence House. They're in black tie, because Margaret wants it to be a special occasion. 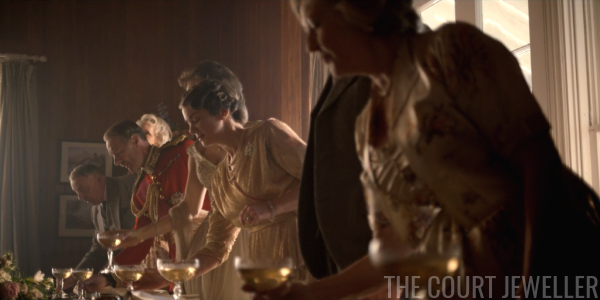 Here, you get a brief glimpse of Elizabeth's diamond bracelet. Everyone is very stiff and formal, at least until Margaret dismisses the staff. 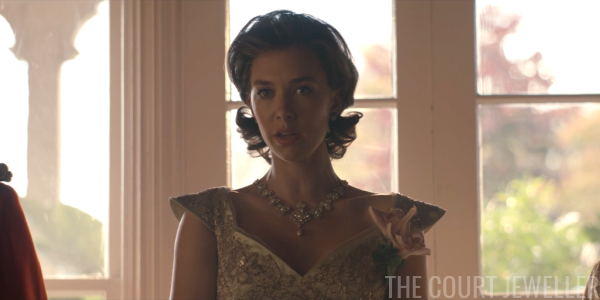 She wears an era-appropriate suite of gold-toned jewels. 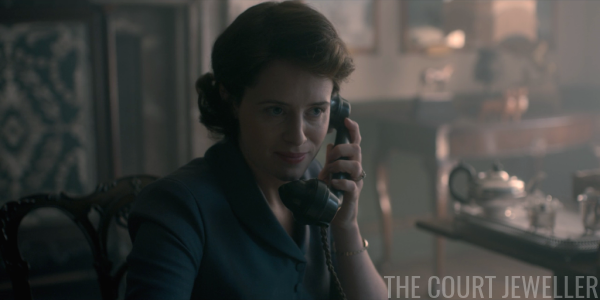 She informs Elizabeth and Philip that she and Peter want to get married. 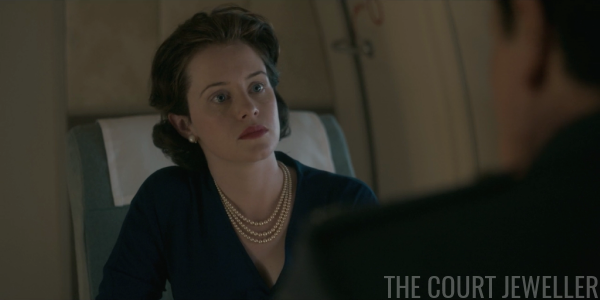 We get a good look here at the suite of sapphire and diamond jewels that Elizabeth is wearing. These aren't replicas of the Queen's actual sapphire suite (which was a gift from her father). 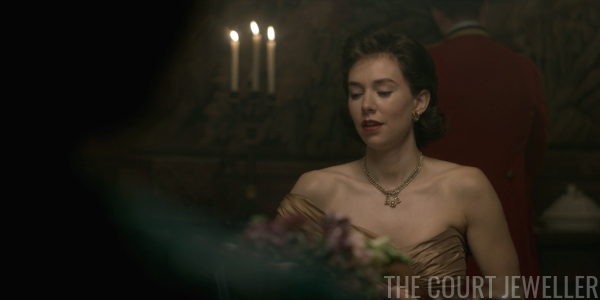 Instead, this necklace looks like it was inspired by the original tiara from the Cambridge Sapphire Parure, which belonged to Princess Marina, Duchess of Kent at this point in time. Elizabeth is a little reticent about the relationship, but she can't say no to her sister's happiness. Margaret is so thrilled that she even gives us a glimpse of her bracelet. And Peter, who now gets to call Philip by his name instead of "sir," is pretty pleased as well. 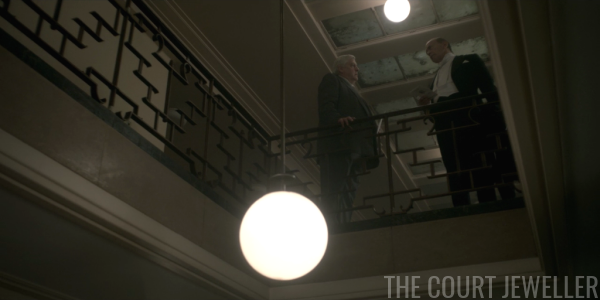 But in the car, Philip and Elizabeth have a lengthy, sometimes contentious discussion of the issue. Philip thinks that Peter should go back to his wife (although Peter is officially divorced). 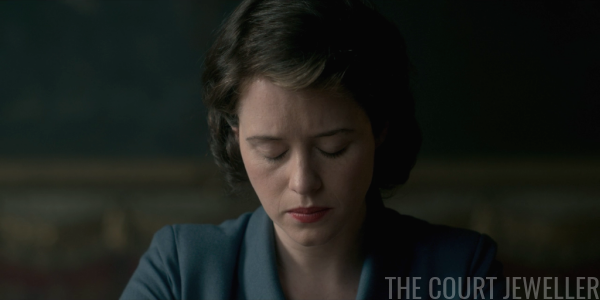 Elizabeth wants Margaret to be happy. 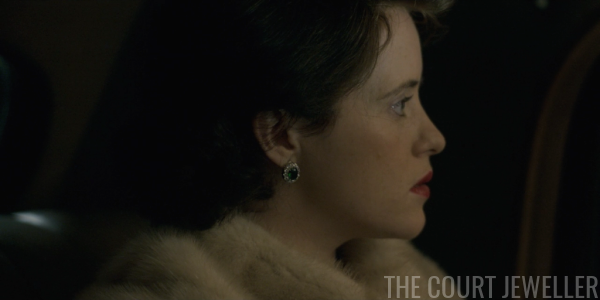 I'm just glad we get a good look at these sapphire cluster earrings. A note on the historical timeline here: Townsend was officially divorced from his first wife in November 1952. At Christmas, he told Tommy Lascelles about the relationship, and said at that time that both the Queen and the Duke of Edinburgh knew. The Queen Mother was reportedly told by Princess Margaret in February 1953. 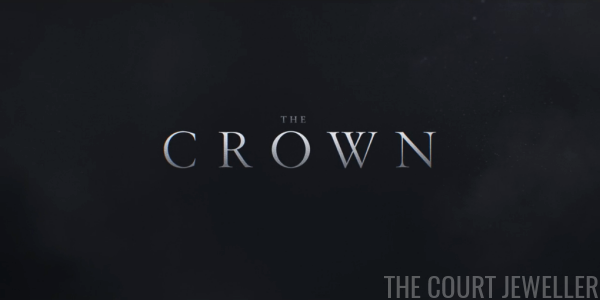 The Crown is fudging the timeline here for dramatic purposes. Things are about to, er, hit the fan. The News Chronicle reporter has finished his story, and the editor speaks to the paper's owner about publishing it. The editor refers to the story as "gelignite" -- an explosive. (Hence the title of the episode, an interesting choice given that several scenes take place in Northern Ireland.) There's a lot of discussion about whether printing the story is appropriate. 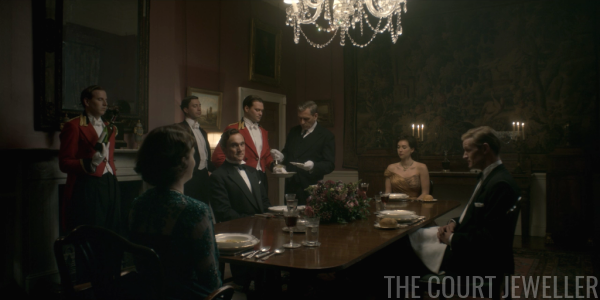 The editor argues that, by televising the coronation, the royal family has broken the traditional rules of deference and respect regarding media coverage. 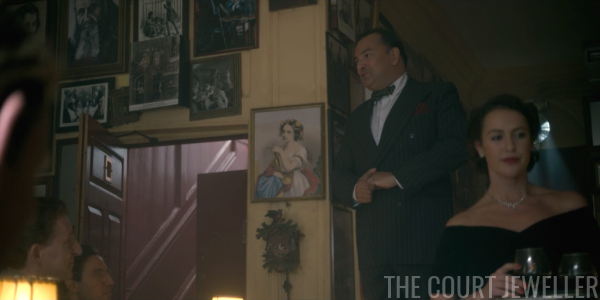 The owner goes straight to Tommy Lascelles to hash things out. Let's take a moment here to appreciate the hair and makeup team of the series, shall we? 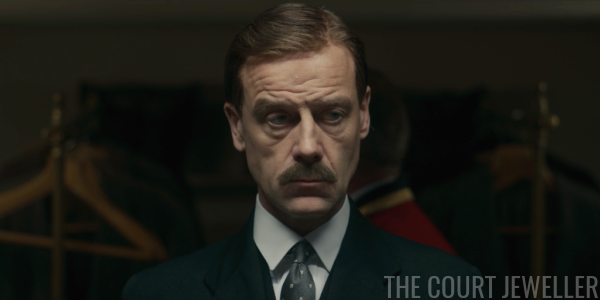 Pip Torrens, who plays Lascelles and has such wonderfully expressive non-expressions in the role, is bald in real life. This is Tommy's face on his arrival at Clarence House, where he's gone to tell the Queen Mother about the impending press coverage of the affair. 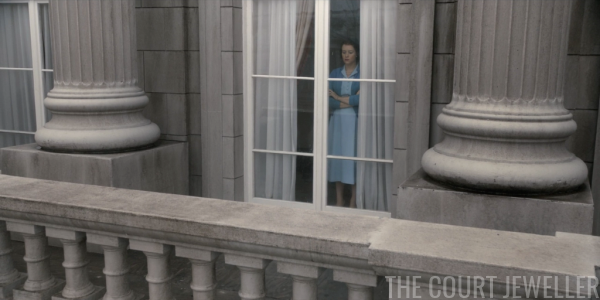 On his way, he catches Princess Margaret throwing a rager to celebrate her victory. She gives him this look, and then shuts the door in his face. 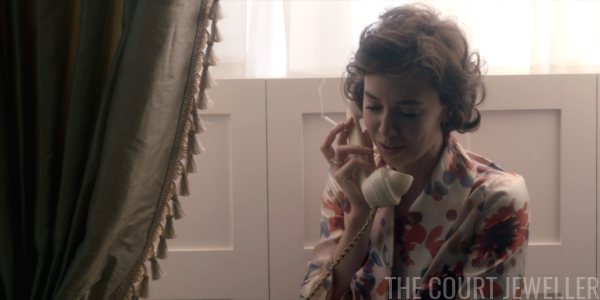 The next morning, Elizabeth calls her sister to chat about the romantic revelations of the night before. She suggests that Margaret should consider a Scottish wedding, because the Church of Scotland allows divorced persons to remarry in the church. Margaret's got her ring on her right hand again as she entertains the possibility (and, of course, smokes like a chimney). 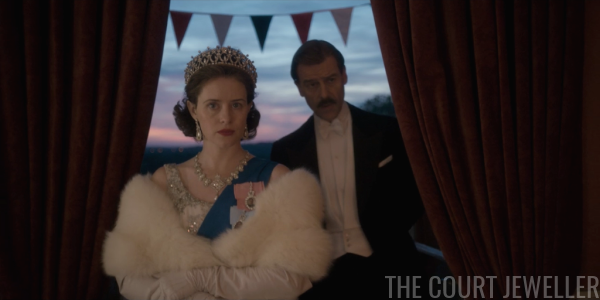 We see this right-hand ring over and over again this episode, just as we see the Queen's wedding and engagement rings several times. 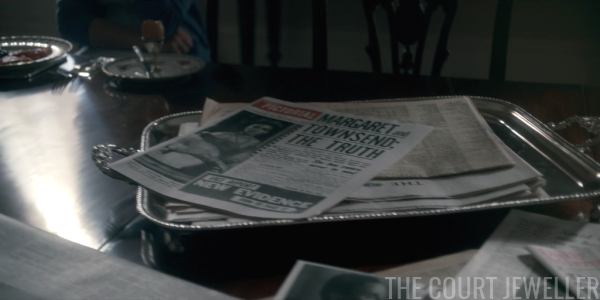 Perhaps we're meant to see Margaret's ring as a reminder of the left-handed rings she's been so far denied? But she did have another diamond ring that is now very famous: the diamond ring that Prince Charles gave to his second wife, the Duchess of Cornwall, as an engagement ring. 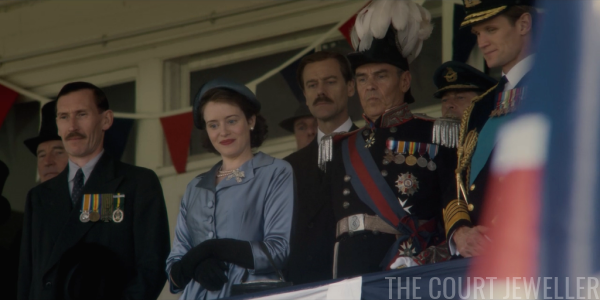 I have no idea if the production knew about the links between the Queen Mother and that particular ring, but if this is meant to be Camilla's ring, it's a great inside-baseball reference. 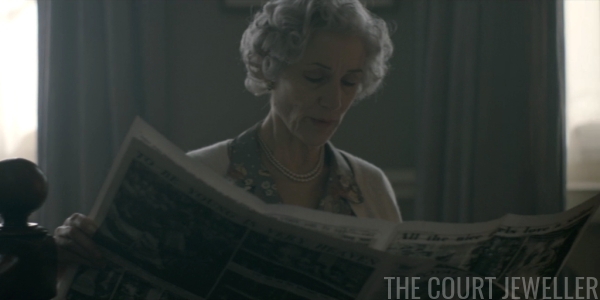 Camilla was divorced (with a living spouse) when she married Prince Charles -- exactly the same position that Peter Townsend is in during this episode (and that Wallis Simpson was in during the abdication crisis). The royal family's perceptions of divorce shifted radically between 1936/1953 and 2005 -- and part of that shift included the death of the Queen Mother, whose opinions about divorce, the abdication crisis, and the death of her husband were all intertwined. At Buckingham Palace, the Queen Mother and Tommy Lascelles have a come to Jesus talk with the Queen about Margaret and Townsend. 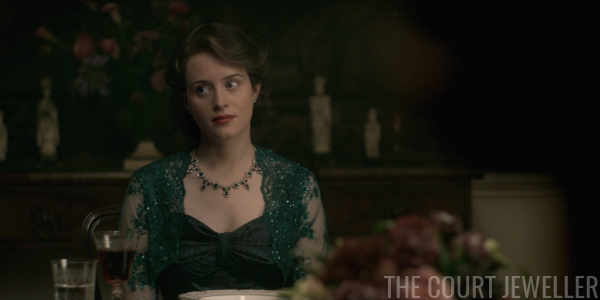 Note that Elizabeth does not wear her pearls in this scene -- no necklace or earrings, in fact. 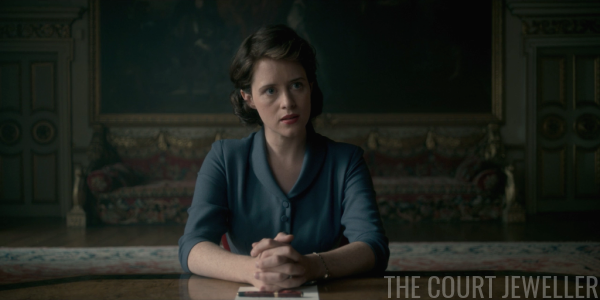 We tend to see her without her pearly queen uniform in scenes where she is being "Elizabeth Mountbatten" rather than the Queen. And indeed, she's trying to act as a sister here, not a monarch. But that's precisely the problem -- she is the monarch. 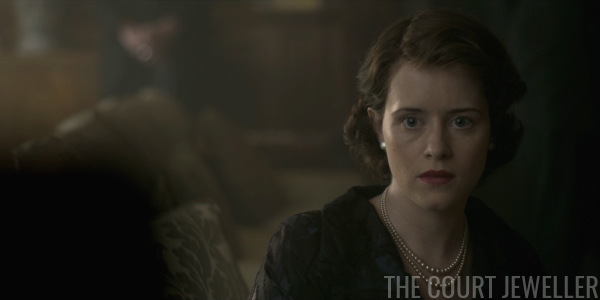 The Queen Mother, who is wearing her pearls, reminds her that popularity can be fleeting, and her position can be severely damaged with one wrong decision. 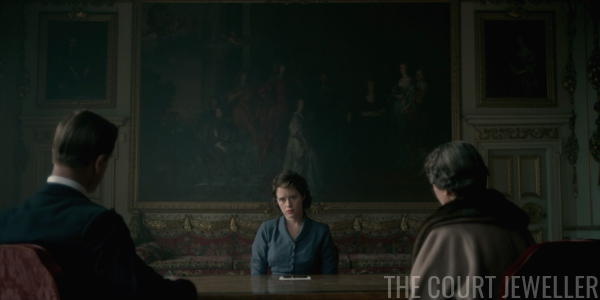 At the end of this meeting, Elizabeth knows that she must ask her sister to wait two years, until her 25th birthday, to marry Townsend. As the Queen, she can't take the risk of granting her permission. She's going to have to ruin her sister's happiness, and she's crushed. The News Chronicle follows through with the publication of the story. The paper here is dated June 14, 1953 -- the precise date that People broke the news in real life. 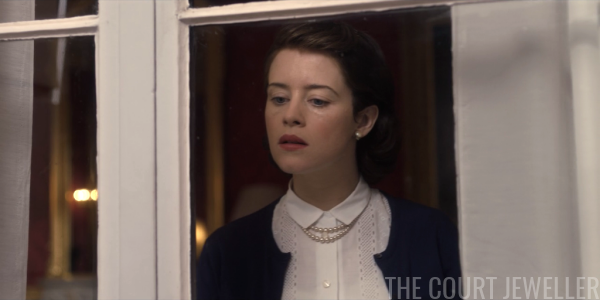 We get pictures of Margaret in that terrible non-replica tiara from the coronation to illustrate the story. 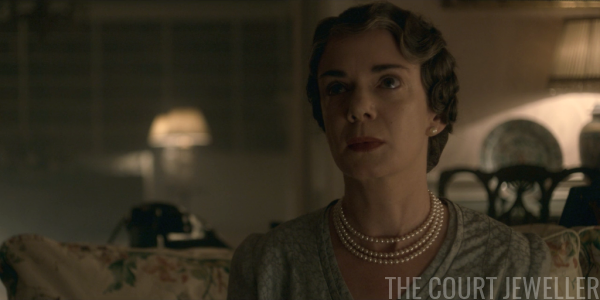 Elizabeth wears her queenly pearls to tell Margaret that a) she has to wait two years to marry Peter, b) Peter can't go with her on her upcoming trip to Rhodesia, and c) Peter's going to have to take a posting somewhere else. This is Margaret's face as she processes. 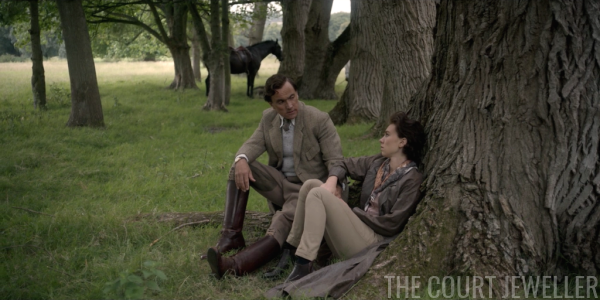 Margaret's distraught, and she and Peter go riding off to have some private time together. He tells her that he's going to take one of the positions offered to him: a posting in Belgium. Everybody's upset. But before he leaves, the Queen grants Peter a consolation prize: he can accompany her on a scheduled trip to Northern Ireland, and then he and Margaret can have some time together on her return from Rhodesia before he heads off to Brussels. 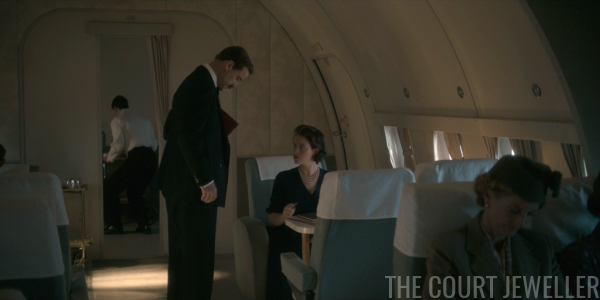 On the plane to Belfast, Elizabeth talks to Tommy Lascelles about the situation, and she fidgets her pearl necklace, just as she did after her accession, as if it's choking her. 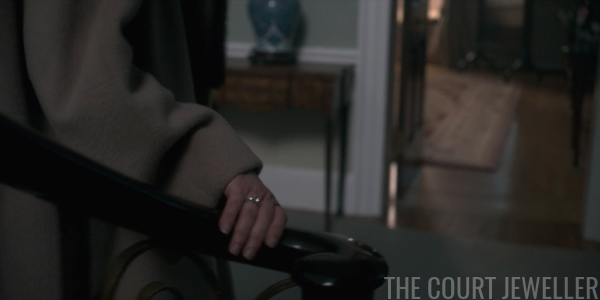 We also get a good view here of her rings and her watch -- marriage and time, thematically popping up again. A be-brooched Elizabeth arrives in Northern Ireland to an adoring crowd. 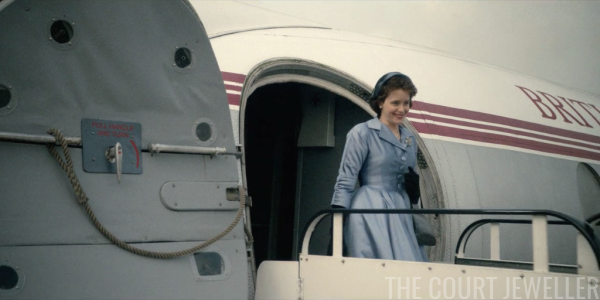 In real life, she arrived in Northern Ireland for her coronation visit on July 1, 1953. Here's newsreel footage from British Pathe. But when she watches the footage of her arrival on television later that night, she notes that Peter is sucking up a lot of the press attention, and she makes this face. For an evening reception at Government House in Hillsborough, Elizabeth puts on her diamond and pearl finery: the Lover's Knot Tiara, the Gloucester Pendant Earrings, and Queen Victoria's Golden Jubilee Necklace. 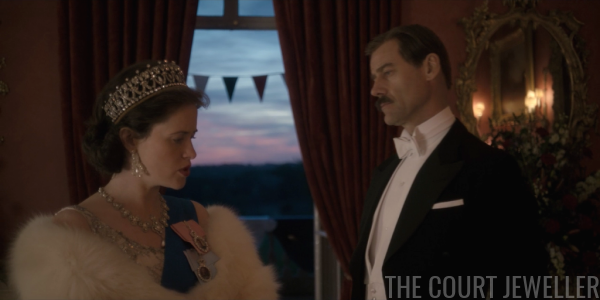 Since we're post-accession and post-death of Queen Mary, all of these jewels are officially in Elizabeth's possession. But -- this was a real event, including the drum tattoo she observes, and these were not the jewels she really wore. 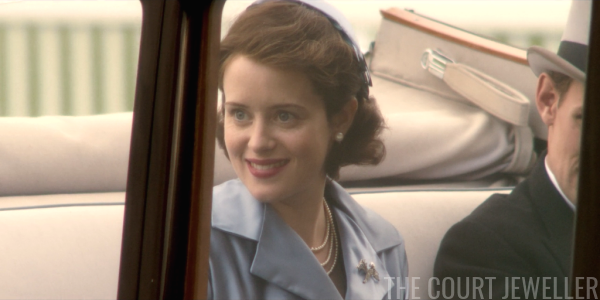 On newsreel footage from the visit, you can see her in the Girls of Great Britain and Ireland Tiara. The necklace can't be seen clearly (though I think it might be the Nizam), and the earrings appear to be a smaller pair. I'm really struggling to figure out why we haven't seen the GGBI yet in the series -- it's such an easy, obvious piece to replicate and use accurately for this period in the Queen's life. The Queen wears the "inspired by" bow brooch near the end of the visit. And then, he calls the Queen "Lilibet." Not while she's wearing her pearl uniform, Peter! Lascelles comes over to ask if "Her Majesty" has made up her mind about Townsend. The reply? "She has." If I'm not mistaken, this is the first time she's referred to herself in third person during the series, and it's an important turning point. 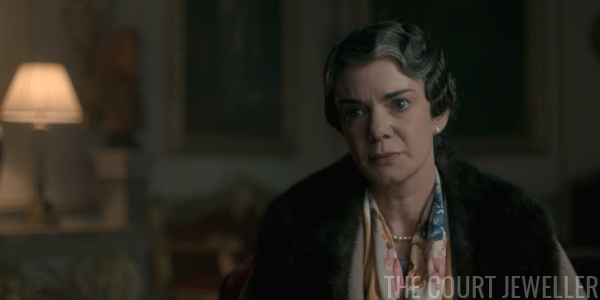 Elizabeth Mountbatten showed up to the meeting with her mother and Lascelles, but the sovereign has now made her decision about Townsend. He's off to Brussels, effective immediately. Curiously, Princess Margaret -- who is giving a speech -- is wearing Queen Victoria's Golden Jubilee Necklace. Uh, couple of problems here. For one: if the Queen is wearing the necklace in Northern Ireland, how is it supposed magically travel to Africa with Margaret? Tough for a necklace to be on two continents at once! For another: Margaret never wore this necklace, which is an heirloom of the crown, in public. There is another royal with a copy of the necklace: Princess Alexandra (Margaret's first cousin) has a version without the center crown. It was given to her by her husband, Angus Ogilvy. To my knowledge, Margaret didn't have a copy. 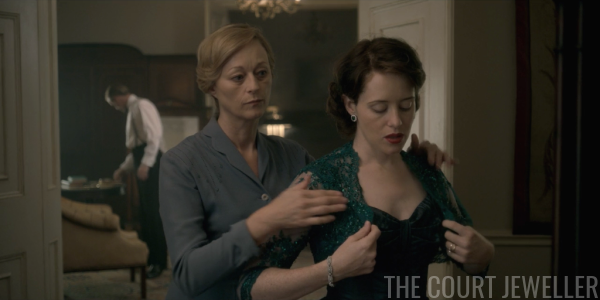 This is a necklace for the Queen, not for her sister. 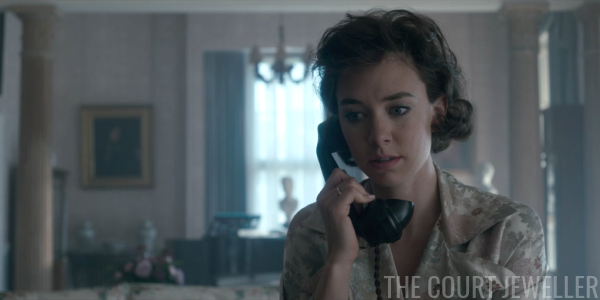 Fictional Margaret finds out that Peter has been sent away via telegram in Rhodesia, and she is super duper ticked off about it. 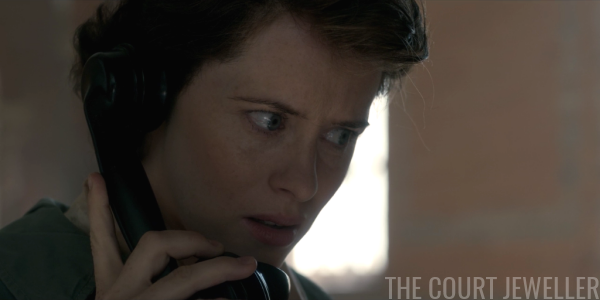 She calls her sister in a fury, and we get another scene with switchboards and operators and connections, and it takes a while for them to locate the Queen at Sandringham. Elizabeth is in Elizabeth Mountbatten-mode at the stables in Sandringham, wearing just her rings and her watch. 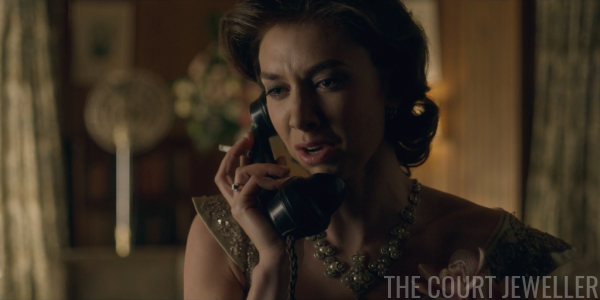 She's taken aback by Margaret's anger over the telephone. 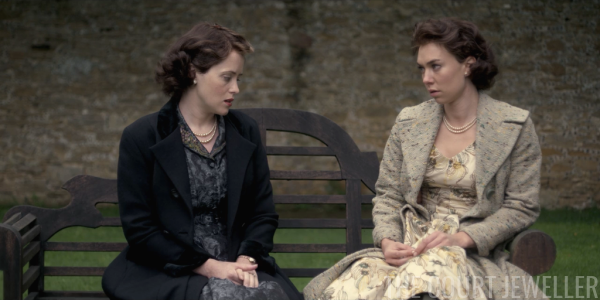 Margaret even accuses Elizabeth of resenting Margaret and Peter's popularity, making veiled threats about the future. 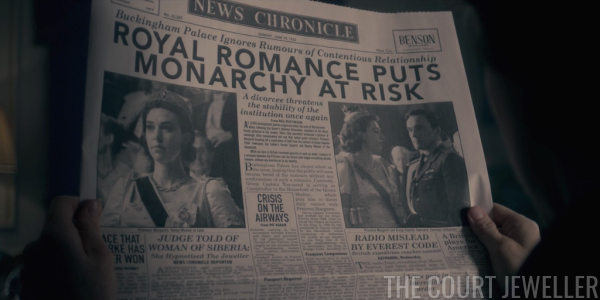 The newspapers jump on the new developments in the story, declaring that Margaret has been "punished" and Peter has been "banished." One newspaper appears to show Margaret in a tiara and necklace. 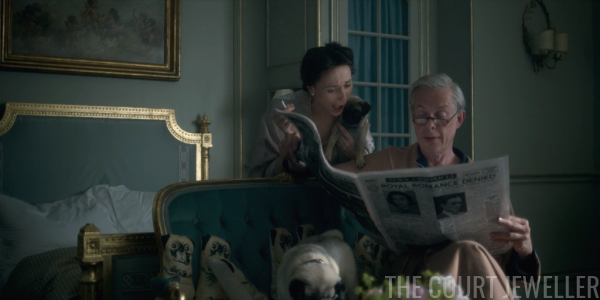 In Paris, the Windsors cackle with their pugs. Elizabeth is still uncertain about the whole business, and she's even more unsettled when Philip leaves again, this time for a house party with Baron and Mike Parker.